President Recep Tayyip Erdoğan has filed a criminal complaint against Republican People’s Party (CHP) chair Kemal Kılıçdaroğlu and 72 other lawmakers of the main opposition party for insulting him by sharing a cartoon on Twitter. The move came after the Ankara Chief Prosecutor’s Office launched an investigation into Kılıçdaroğlu on July 18. Kılıçdaroğlu had tweeted a cartoon on July 17 depicting Erdoğan as various animals to show support for four university students who were arrested this month for carrying it as a placard at their graduation ceremony. “You will tolerate criticism and humor. You should. You cannot stop criticism and humor by jailing people,” Kılıçdaroğlu had said in the tweet addressing Erdoğan. The Ankara Chief Prosecutor’s Office said in a statement on July 18 that it had launched a probe into Kılıçdaroğlu for “insulting the president” as described in the Turkish penal law. 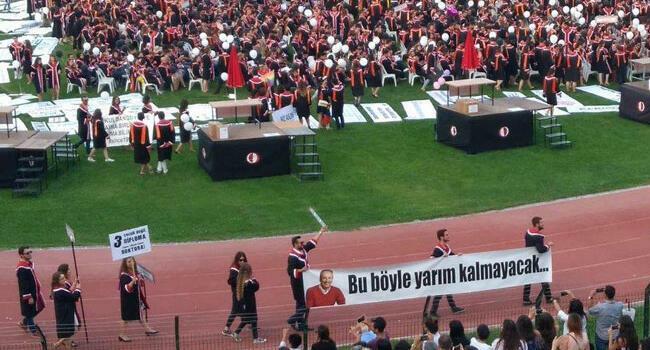 Students carried placards with political messages during Middle East Technical University’s (ODTÜ) graduation ceremony on July 6, as part of the 62-year-old university’s tradition. The placard depicting Erdoğan as various animals, including an elephant, snake and monkey, was originally published as a cartoon by satire magazine Penguen in 2006. Erdoğan had then sued the magazine but an Ankara court acquitted the cartoonists in a ruling that stressed the right of free speech. Meanwhile, Kılıçdaroğlu was sentenced to another hefty compensation in a separate defamation case filed by Erdoğan. According to a July 18 ruling by Anadolu 20th Court of First Instance in Istanbul, Kılıçdaroğlu will pay 359,000 Turkish Liras to Erdoğan for insulting him and his relatives in a row over offshore accounts that CHP leader alleged the president and his relatives hold in the Isle of Man, a self-governing British Crown dependency in the Irish Sea between England and Ireland. The first court order issued regarding the allegations on June 7 had demanded that the CHP leader pay 185,000 Turkish Liras in compensation for insulting Erdoğan.